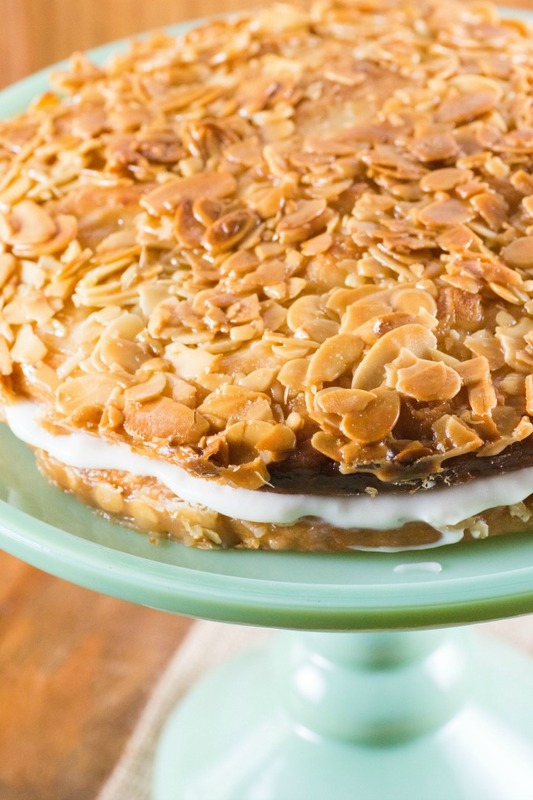 Bee Sting Cake - Bienenstich is a German cake that is perfect for spring. 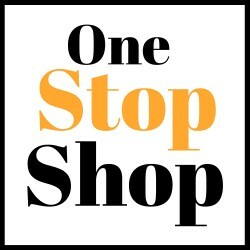 I adore reviewing cookbooks and have done many, many of them on the site. Although the internet is a vast resource for all recipes there is nothing like the feel and vision of going through a cookbook. 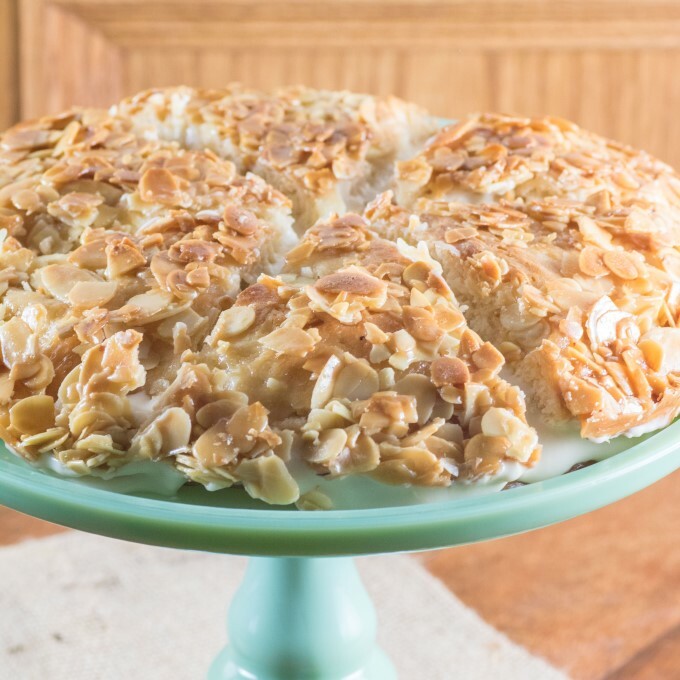 Today I bring to you this amazing Bee Sting Cake – Bienenstich from Poh Bakes 100 Greats by Poh Ling Yeow. 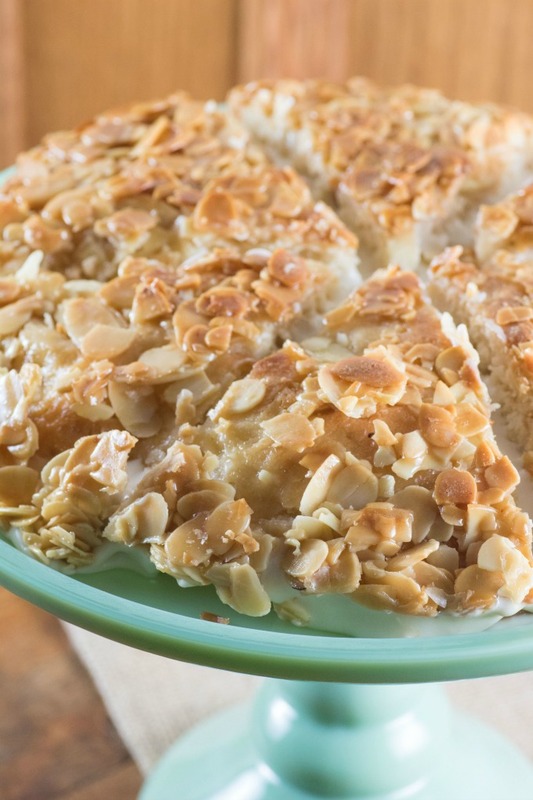 The Bee Sting Cake or Bienenstich is a German dessert. It is a very traditional not too sweet cake that is sliced in half with a serrated knife so that a filling can be added. I think this would be perfect served over Easter! It is in a category of yeasted cakes which I will explain more of. This is just one of the wonderful recipes in Poh’s cookbook that is interesting and different for the reader/cook/baker to explore. See that topping!! Isn’t it amazing!! That creamy filling just calls your finger into the picture for a little swipe and lick. It is flavored with a touch of orange liqueur, quite sublime! Besides being baked in a round spring form cake pan I have also seen it baked in a square cake pan or doubled up and baked in a 9×13″. Bee Sting Cake is different from many as it is not a cake batter at all but made from a yeasted dough like a brioche bread. 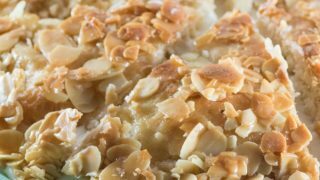 The top is made from crunchy almonds and honey and the interior is a light and creamy custard filling or Creme Patissiere. I made double the Creme Patissiere which is the filling and made the other half into ice cream for my daughter to enjoy! This is a perfect cake for afternoon tea as it is for dessert. 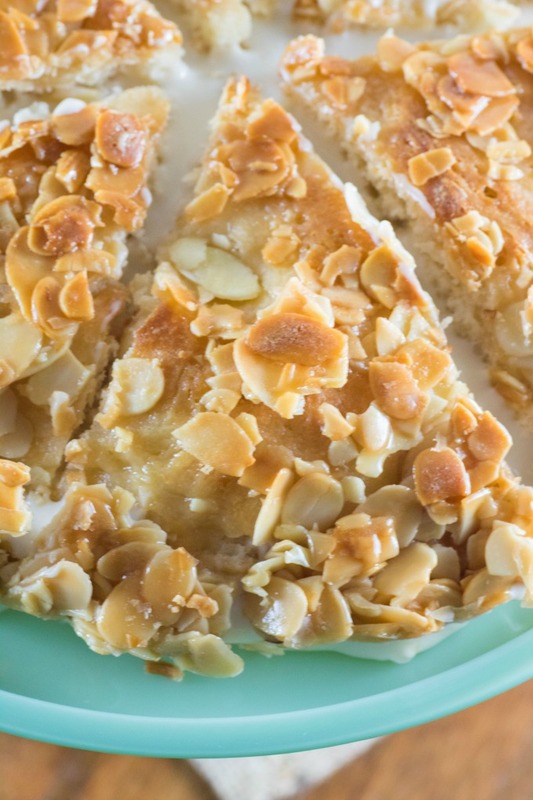 The wonderful topping makes this cake so special. It is crunchy and ooey gooey together and it caramelized to perfection. Simply heavenly!! 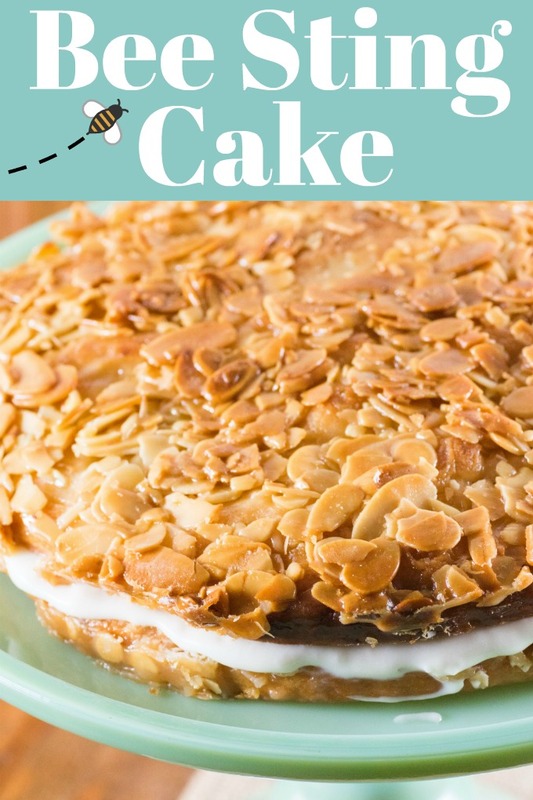 Why is it Called Bee Sting Cake? 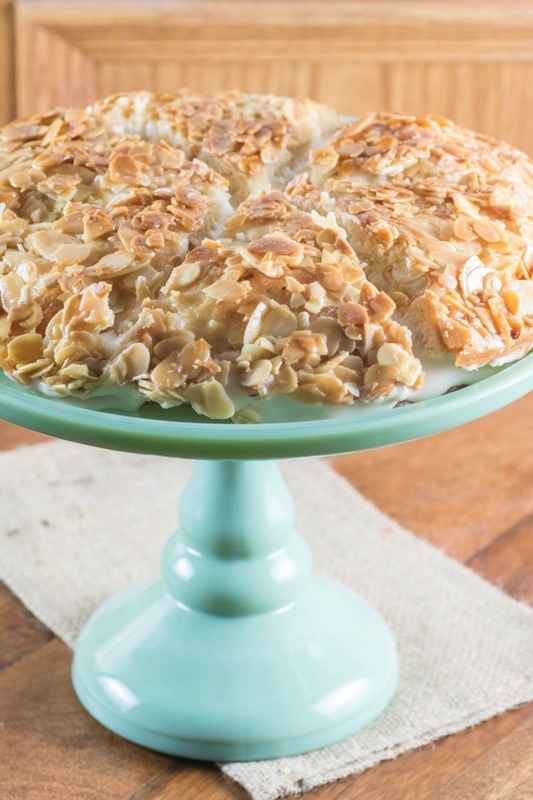 This scrumptious cake is perfect for spring! The name attracted me right off the bat being playful and fun. I have never heard of Bee Sting Cake before. You do not want to get stung from a bee but you sure do want to eat this cake. 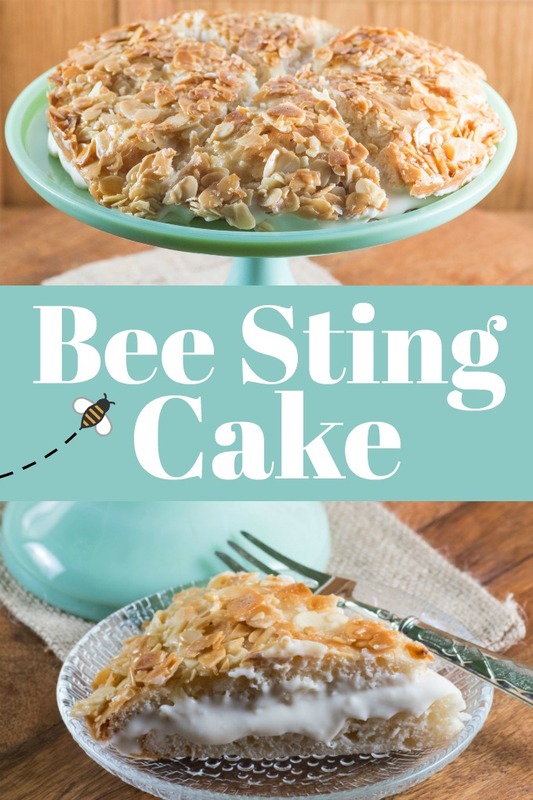 There are two versions of why this is called Bee Sting Cake. The first version of where the name came from was that a bee was attracted to the sweet honey topping. The baker who invented the cake was stung by the bee! Another source for the name was that a group of German bakers in the 15th century lobbed beehives at raiders from a neighboring village. They were successfully able to get them to retreat. The cake was then baked to celebrate. Well, there are no bees here at this time of year but spring is on the horizon as we are quickly moving through January already. It is suggested and this is a great tip, to slice the top before putting it on as the cream filling will just all ooze out and become a big mess. Then you only have to cut through to the bottom to slice a piece, very clever for serving. We just sliced ours in to 6 pieces but the recipe does recommend 10. After a meteric rise in fame after Australian MasterChef, Poh Ling Yeow returns with this amazing cookbook. This cookbook is perfect for any budding baker to whip up masterful creations. Poh Ling Yeow’s must-have recipes have been tried and perfected over her years of baking experience, both as a TV personality and the owner of her café and bakery Jamface. From sweet to savory here are a few picks to try first. Baked Lime & Chocolate Tart, Malaysian Pineapple Tarts, Orange Kisses with Cream Cheese Centres, and Beef Stout Pie with Blue Cheese Crust. Put this cookbook on your top 10 must haves list. Publishing date is February 5, 2019. My custard did turn out a bit too loose as I forgot to whip the cream instead of just adding it. My error, not that it made one bit of difference in it being gobbled down. I’ve eaten Bienenstich for years, not realising it’s really just brioche baked in a round cake tin with a caramel nut topping and custard in the middle! I guess that’s why it’s so important to know the classics because, with these basic skills, so many delicious yet simple things can be made. baking paper over it, then clamp the ring around it to secure. Scrape the dough out of the mixing bowl into the prepared tin. and press it evenly to cover the bottom of the tin. the dough has doubled in volume. Preheat the oven to 180°C (350°F) fan - forced. has melted and combined. Stir in the nuts, then set aside to cool. Otherwise the nuts will shred the brioche on the way down and all the custard will ooze out. slices, cut all the way through the bottom half and serve. This is best eaten on the day it is baked. Microwave the milk in a large heatproof bowl for 4–5 minutes on the highest setting. Meanwhile, whisk the egg yolks and extra eggs with the sugar until pale and thick. Do not allow the sugar to rest on the eggs for any length of time before whisking vigorously, or it will pickle the yolks unevenly and create a lumpy mixture. Whisk in the cornflour until smooth. Add to the hot milk, and whisk to combine. Microwave for 2 minutes, then whisk madly until smooth. Repeat this twice, or until the mixture is very thick and swirls stay put like whipped cream. Cool for about 5 minutes, before whisking in the butter and vanilla until combined. Allow to cool for about 30 minutes, whisking enthusiastically every 10 minutes to get rid of any steam trapped in the custard and helping it to set. Cover with plastic wrap pressed directly onto the surface of the custard, and refrigerate overnight or until completely chilled before using. When ready to use, whip together the crème pâtissière and Cointreau with an electric mixer on high speed until silky and glossy. 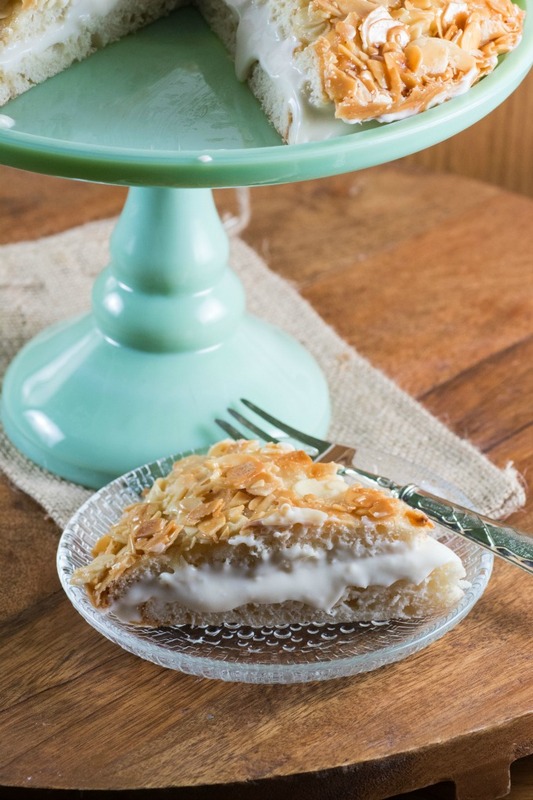 If you want the crème pâtissière to be lighter, whisk in some Crème Chantilly (see page 203) or even a tiny bit of milk. 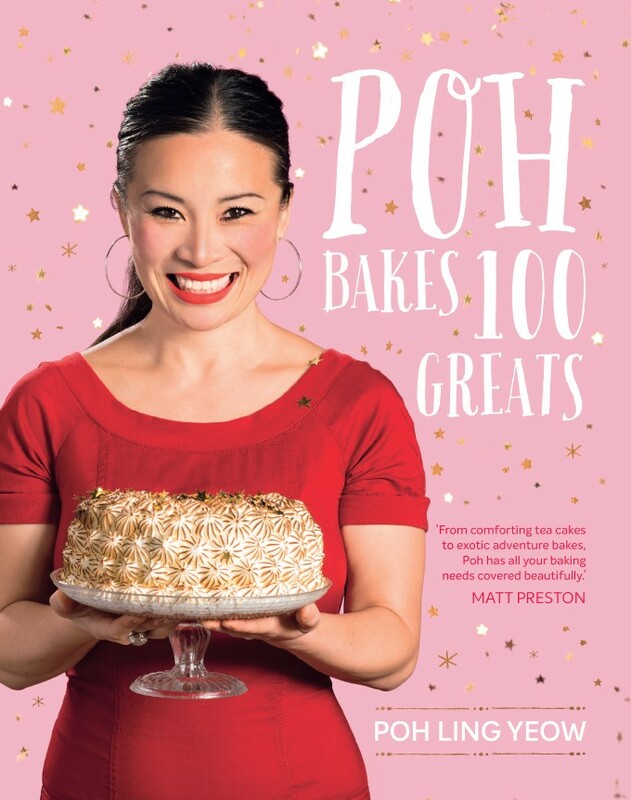 Courtesy of Poh Bakes 100 Greats by Poh Ling Yeow. Reprinted with permission from Murdoch Books. Available where books are sold February 5, 2019. Okay. This is the kind of bee sting I can get behind. That looks so good. I have to make this! What an interesting cake! I never heard of this before! I lived in Germany for five years and never saw or heard of this. Must be more of a regional thing I guess. I’ve never made a cake like this! It does sound really good though. What a cool idea! Looks so mouth watering and I am sure it tastes heavenly! I am not very good at baking, but I will send the recipe over to my sister who is the cake guru in the family. I will watch her make it then I will try to make it by myself. Good luck, I hope it turns out excellent for both of you! This dessert sounds so good! I would love to sample it because I love honey and almond. Oh my goodness! This cake and this cream! I wish I had a piece with my morning coffee! It looks amazing! I can’t wait to try it! Love everything in your recipe! I love new and interesting cakes! I have never heard of this before. I am going to definitely have to check this out! I bet my family would love this cake. I have never heard of this cake before. It looks so good and different. I like that it is made different than cake batter.